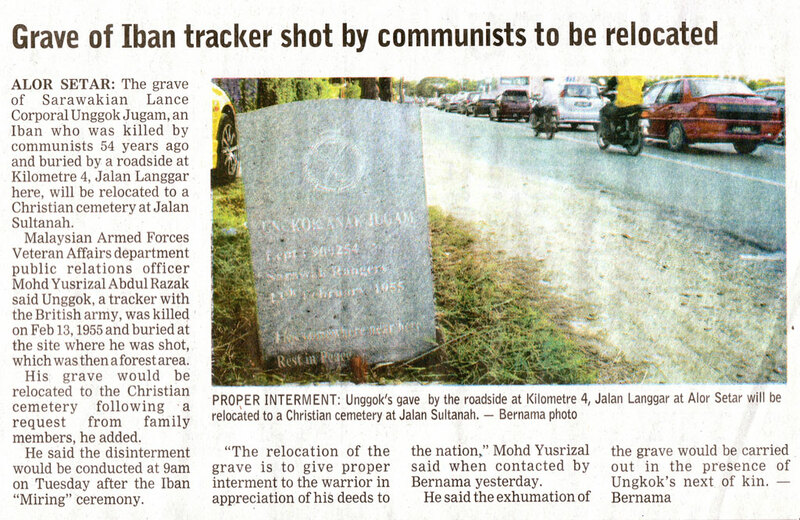 A big Thank You to Mohd Yusrizal or better known as Rizalbob on the Internet, for his noble act to give Unggok a proper burial. This is only one example of our Sarawakian heroes who died while defending the nation against its enemies. We remember quite well during the launching of his book, Rizalbob was given the green light by our Chief Minister withness by Datuk Patinggi Jabu, other ADUNs and members from the ex-servicemen associations that a Heroes Burial Ground should be built in Kuching and the remains of 19 other Iban Trackers and rangers serving in West Malaysia and Singapore to be brought home to Sarawak. Although it was a quick verbal agreement from the Chief Minister, we hope the relevant ministry and agencies will do a follow-up on this issue. I would love to bring this proposal in writing to YB Datuk Seri William.. and Rizalbob, we see how it goes from there..
Did Najib missed Sarawak Rangers? When will we see more Dayak blog? Just a little correction. I am the “rizalbob” that you mentioned. My actual name is Robert Rizal Abdullah @ Robert Madang Langi NOT Mohd Yusrizal. The latest on this case is an article in the Borneo (Sunday) Post (May 3, 2009). My letter to YB Dato Sri William Mawan is in the post to him. Next Next post: The annual haze is back!